← We have an extra day! How will you use it? 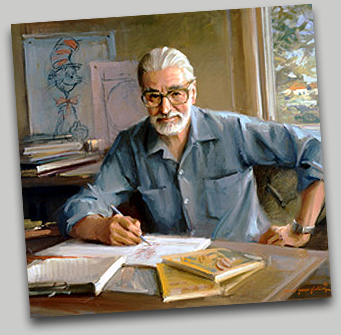 Before today is gone forever I want to mention the famous and talented Dr. Seuss – Theodor Seuss Geisel. He was born March 2, 1904 and lived until September 24, 1991. That’s 87.5 years. I read somewhere that sometime along the way one of his teachers or professors told him he couldn’t draw and his art would not catch on. hmmm I guess somebody was wrong! That goes to prove that you should never give up if you are passionate about your talent. It may be just what the world is waiting for. If you would like to read lots of information about Dr. Seuss, go here. HAPPY BIRTHDAY, DR. SEUSS! And Thank You! 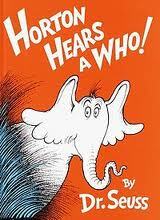 What Dr. Seuss books were the most popular in your house? Is there one Dr. Seuss book in particular that you wish you had written? This entry was posted in Mostly About Reading and tagged children's books, Children's literature, dr seuss books, Dr. Seuss, Green Eggs and Ham, Happy Birthday Dr. Seuss, Horton Hears A Who!, reading, Theodor Seuss Geisel. Bookmark the permalink. The Cat in The hat was the most popular Dr. Seuss book at our house and it was read over and over. I believe at one time I had it memorized. Such a fun one. 🙂 Thanks, Darlene. “Green Eggs and Ham” is Josie’s and “Would You Rather Be A Bullfrog” is mine…and “Marvin K. Mooney Will You Please Go Now!” …. and “Go Dog Go!”….there are so many great Dr. Seuss books! Thanks for the titles I haven’t read yet. Where indeed! He was not afraid to be different, and his persistent efforts paid off, much to our delight. Lynn, have you visited seussville.com? It’s lots of fun. So hard to pick a favourite Dr. Seuss book… maybe One Fish, Two Fish, Red Fish, Blue Fish. It’s the one I still quote at times even though our kids are mostly grown up. Hi Janet, welcome to my blog! Yes, I visited seussville.com and passed the link on for my grandson. I don’t know if he has visited it yet. There’s lots to do there.